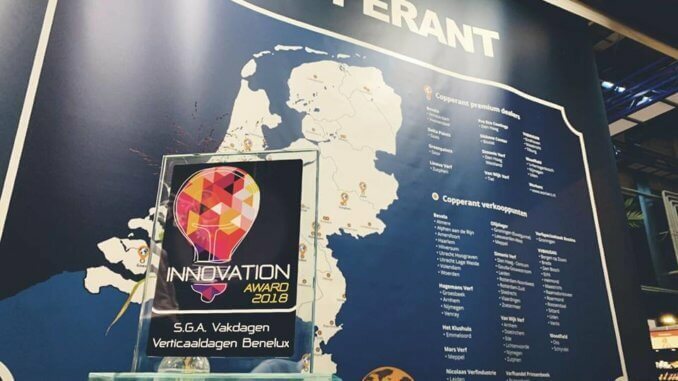 Copperant paint won the Innovation Award 2018 at the SGA Vakdagen in Gorinchem, for the Copperant Altra, the first plant-based, titanium white-free, matt wall paint in The Netherlands. Copperant is a brand of Baril Coatings, designed for professional painters who want to consciously opt for sustainable craftsmanship. The innovative new products, Altra Spackling Spray and Altra Wall Paint, are both plant-based, titanium white-free and non-toxic. The paints are not only safe, but also environmentally friendly and produced using only solar power. The line will be further expanded in 2019 with plant-based sealer, primer and lacquer paint. The new products are available at the Copperant outlets in The Netherlands.